I’ve seen this question pop up time and time again, and I can totally understand the frustration that goes along with it. Sadly, I usually field this question after a client has purchased a non-controlling (or minority) interest in a company or their estate planning attorney recommended they hire me for a “discount” analysis. That’s why I’m writing this article—so hopefully I can help you even before you purchase or gift shares in an operating business or real estate holding company. In all honesty, business valuation is trickier than many business owners and shareholders often realize—especially for those owning less than a controlling interest in a company. It seems logical that owning a certain percentage of interest of a company would equate to owning that much of the entire company value, but that certainly isn’t the case if you are trying to sell, gift or value your minority interest. In this article, I will try to explain some of these complex concepts to further your understanding of business valuation, discounts, and the value of a minority interest in a business. The shares of a company can have many different values based on the standard of value being used and where the interest falls in the hierarchy of values (shown below). To give you a better understanding of the different values associated with different types of ownership and buyers, we’ll be using “The Hierarchy of Values” chart. 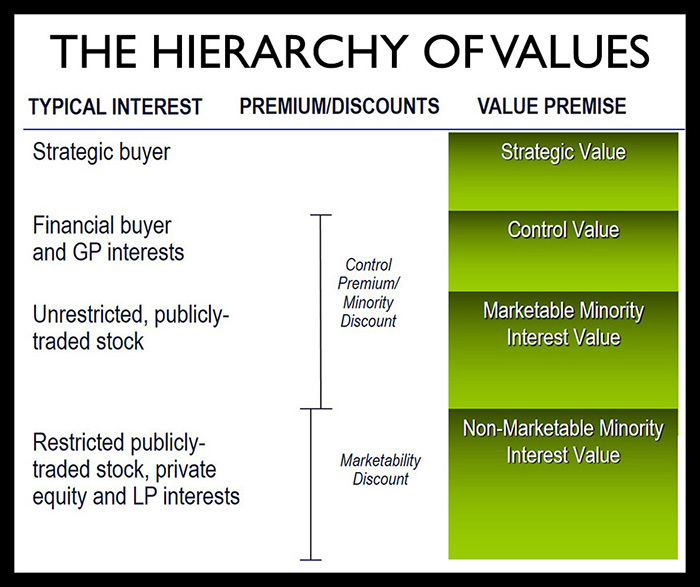 This chart illustrates the relationship between different types of interests, premiums/discounts, and value premises. Strategic buyers are those will most likely pay more in an acquisition than the company could receive if it sold to a financial buyer or if the valuation was being done using the Fair Market Value standard. So if a company like Microsoft wants to acquire software owned by a competitor that it knows can be sold to millions of current and new customers, the software company has a strategic value and Microsoft is willing to pay more than the Fair Market Value. Strategic buyers usually already have their distribution channels in place and know how the product or service will fit in their pipeline, making it more valuable to them than to another buyer. This premise is usually only associated with acquiring a controlling interest in the target (over 50% of the company). Probably the most common type of valuation we see deals with control value. This is what financial buyers will pay when there are no existing synergies. For the most part, these financial buyers are just buying the company as is, marketing to the same customers and hoping to grow. The “control” level of value is used when valuing a controlling interest in a business or real estate holding company under the Fair Market Value standard, usually for estate tax, gift tax, or income tax purposes. This is also only associated with controlling interest owners. Valuing a minority owner’s share of a company is different than that of a controlling owner. Let’s say you own a few shares of Microsoft. That makes you a minority shareholder (or interest holder) of Microsoft, and those shares are unrestricted and publicly-traded. So, they are completely marketable, meaning that others want and are able to purchase them, and they are able to be sold for cash in just a few days. Although you own these marketable shares, you are still a minority shareholder, so your shares would have a minority discount already baked into the publicly-traded price. DEFN: Minority Discount or Discount for Lack of Control: A discount applied to a controlling owner’s shares of a company to get to a minority value. It is a mirror image of a control premium (the premium a buyer would pay over the publicly traded per share price to obtain control of a publicly-traded company). Example: Let’s say Lauren has a 30% minority interest in a company. This level of ownership does not entitle her to many of the benefits that majority owners are entitled to; therefore, she receives a minority discount of let’s say 20%. A buyer is only willing to buy at a reduced price to the control value, especially when profit distributions are uncertain and there are no plans to sell the company anytime soon. 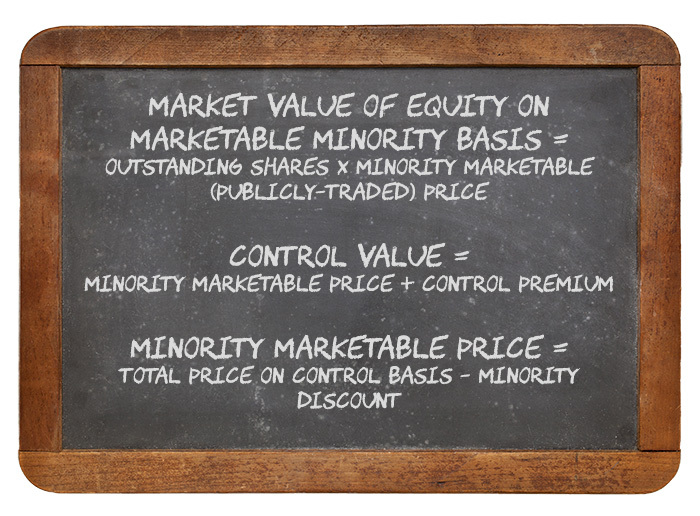 Minority shares in a private company may also have a marketability discount applied. The shareholders have no control over the sale of the company and there is also no market for selling shares. So if something happens that the shareholders need money and want to sell their shares… who are they going to sell them to? There’s not a pool of buyers, nor is there a publicly-traded market available. To get to the non-marketable minority interest value from the controlling company value, you would take both minority and marketability discounts. These discounts often range from 25-50% combined. DEFN: Marketability Discount: According to the International Glossary of Business Valuation Terms, marketability is defined as “the ability to quickly convert property to cash at minimal cost.” Given two identical business interests, a higher price will be paid by investors in the market for the business interest that can be converted to cash most rapidly, without risk of loss in value. Interests in a closely-held business, partnership, or other privately-held company have limited marketability because they are more difficult to sell than other interests, such as publicly-traded stocks. Example: Teddy gave his daughter Lexi, a 10% interest in his closely-held business. The value of the business is $1,000,000 and Teddy applied minority and marketability discounts that totaled 40% to the gift. The Fair Market Value of the gift would actually be $60,000 as opposed to $100,000. 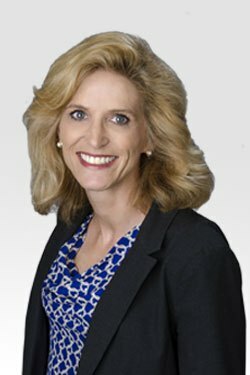 I hope that this article provided you with some clarity on the different levels of value for controlling and minority interests. As you can see, controlling shareholders enjoy many privileges that minority shareholders do not. It is because of these benefits that the value of minority shares are lower when it comes to the overall company value. These are important concepts to be aware of and understand, especially prior to investing or estate planning. If you have any other questions or would like to know more about valuations for estate planning, levels of value, or minority and marketable discounts, feel free to reach out by clicking the button below. Hope to hear from you soon!